We’re covering a very familiar topic — the design process. We went back and forth answering each other’s questions, describing the process for our last project at Hexanine, a logo for BevReview. Think of it as the teaser before the big reveal of the final design. Brigid and I each took turns asking the other questions, and responding in turn. Read on to find out what our process was and what we learned along the way. Can you explain the brief for this project? Chris: BevReview is a beverage blog ran by Steve Tanner. His blog discusses everything from taste and nutrition facts, to the packaging of the drinks. All of the BevReview posts focus on non-alcoholic beverages. 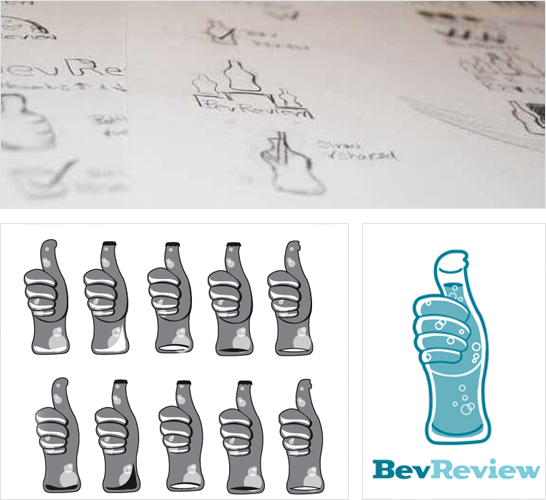 Brigid and I took on the task to create a logo that shows BevReview as a fun and credible resource in the beverage industry. 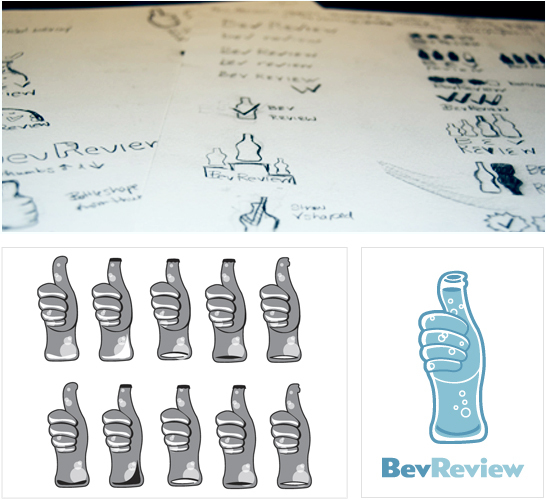 The goal was to give BevReview a logo that will stay true to it’s brand. Would you like to talk about what kind or research we did for the project? 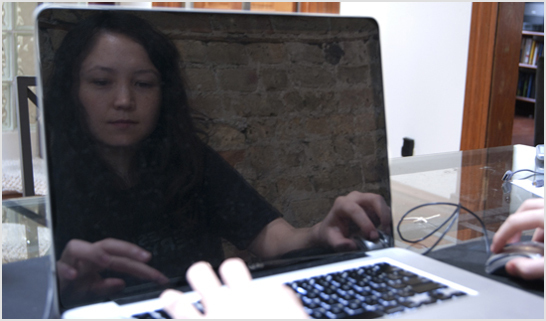 Brigid: I researched the company, industry, and their competitors to find out who they are and their target audience. From our initial meeting with BevReview, I was handed the task of focusing on the concept of rating. So, I began by writing words that could be used to describe or symbolize rating, such as, checks, thumbs up and down, scale, arrows, ranking using bottles or caps, etc. I knew I wanted to be a designer when I fell in love with the designs on the skateboards. I remember buying my first Birdhouse skateboard when I was 13. Besides the rhythmic sound of my wheels rolling against the pavement, I noticed that each skateboard brand had its own look and feel, expressed through the designs. Some had skulls, stencils, and even intricate geometric designs. For me, I saw endless opportunities for design on these unique canvases. My friends and I would compete—not just to see who could pull off the coolest tricks, but also for bragging rights for the best designed board. This was my first taste of graphic design. Maybe it was the smell of the dark room, the process, or possibly my teacher. Whatever the medium, I knew I wanted to become a designer during a photography class in college. 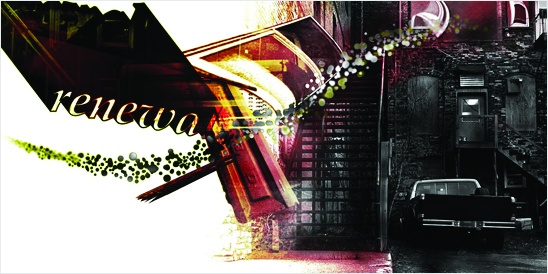 Mainly it was my discovery of Photoshop in this class that got me immediately hooked. It was just my luck that I only became aware of the design tools towards the end of my college career. In past jobs I’ve always had to solve problems. But in design, I actually care—passionately—about those problems and solutions. So much so, that it’s a sort of obsession engulfing any kind of life outside it. There’s a lot more to design than making things look pretty. It’s strategic and conceptual. From all the challenges I’ve had and continue to have, the main constant is that I try and come up with a design solution that has a strong concept. This takes practice, so my current design stage right now is Student/Sponge. While attending classes at Chicago Portfolio School, I also try to soak in events, join groups, and meet/listen to as many people as I can without going completely mad. I’ll be exploring and sharing my experiences in the transition from book to street smarts, using what I know from school and applying it—or rather, having it evolve, to my working experience with Hexanine. I hope to come out knowing the art of balancing business and design, experiencing the challenges of having to compromise while still creating quality design solutions.